Stop Overreacting It’s Just A Sock with Jan Bedell, PhD – your brain coach. Do you ever want to just yell, “IT’S JUST A SOCK, put it on your foot!”? It is hard to understand the reaction of some children when their tactile system is giving the wrong messages to the brain. The sensory system is the gateway to overall function. You first have to get the correct input from the sensory system to be able to use that information in life. When it is not functioning correctly, it sends messages to the brain that are interrupted as pain. This is often labeled Sensory Integration Disorder (SID) and the symptoms can also be found in the labels of Autism, ADD and ADHD. These sensory messages shouldn’t be painful. However, if the system is not functioning correctly or is functioning in a hyper sensitive manner, they register as pain to that individual. If on the other hand, the messages are hypo (not enough), then the individual doesn’t have awareness of the signals from the environment and, therefore, doesn’t feel what they should. All of these are symptoms of a tactile system that has immature pathways. This means the messages to the brain are getting corrupted, making the individual feel too much or too little. No one has to live with these often debilitating effects of a sensory system that is misfiring. The NeuroDevelopmental Approach promoted by Little Giant Steps can teach you how to make these sensory pathways mature and functional. 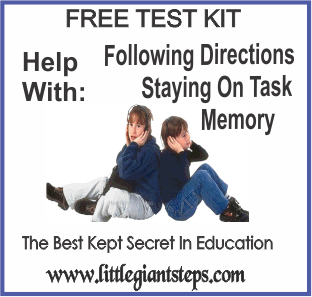 You can gain more information about this approach in the other podcasts listed here or visit http://www.LittleGiantSteps.com/our-services or http://www.LittleGiantSteps.com/learn-more for ways to get help for your child.